God has placed numbers strategically throughout the Bible to point to His ten-step redemption plan. Symbolism associated with numbers one to ten reveals that each number represents progressively intricate elements of the plan. For example, the number one represents God the Father, but it also represents beginnings, creation, and separation (darkness from light, water from land, etc). The most valuable aspect of the Redemption Pattern is understanding God's ten progressive steps of spiritual growth. 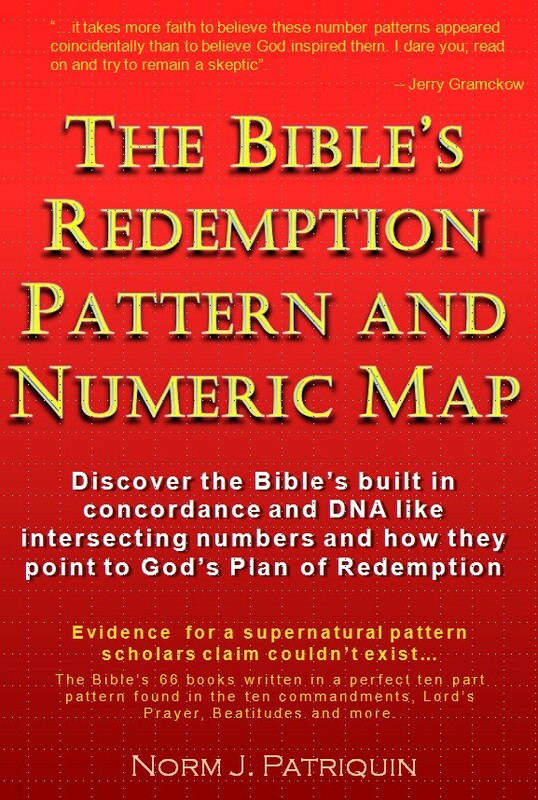 This book explains numbers’ symbolism, as well as showing the incredible DNA-like intersection of numbers across Scripture, numbers that form a Numeric Map and built-in Bible concordance. Numbers validate that the Bible, miraculously, still exists as God intended, and they prove the Old and New Testaments are two inseparable parts of one book. While many believe numbers studies should be avoided, this book shows how God uses numbers in very precise ways that, when understood, contribute to more-accurate biblical interpretation. Number meanings are easy to use and don't reduce study to numerical analysis. Instead, they add exciting new dimensions to understanding God's Word. Gaining understanding of biblical numbers will transform your Bible study into a great adventure. Compelling evidence proves these claims can't be coincidence. Examples include – John 3:16, the keystone verse for Christianity, is in the 1,000th chapter. Matthew 24:42, warning of the "Day of the Lord," is the precise 24,000th verse. Psalms 117, the only two-verse chapter, is located exactly as the Bible's middle chapter. With much more amazing discoveries inside, get ready to be amazed. Norm Patriquin retired from his executive role in software development to pursue research and writing about patterns in the Bible's structure and text. Not a biblical scholar, he stumbled on the first hints of these discoveries in 2001, purely by accident. Norm resides in Southern California.